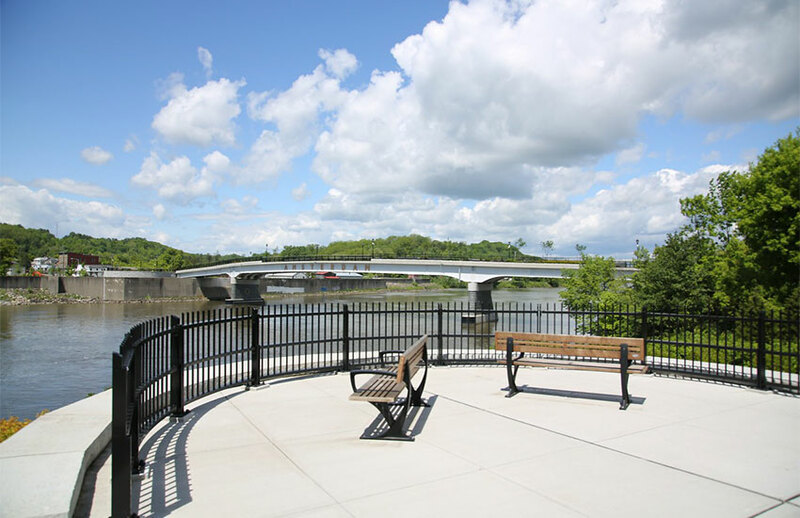 Dedicated on August 31st, 2016 by New York State Lieutenant Governor Kathleen Hochul, accompanied by Congressman Paul Tonko (the main proponent of the project), the bridge was the culmination of over a decade of planning, funding, design, and construction. 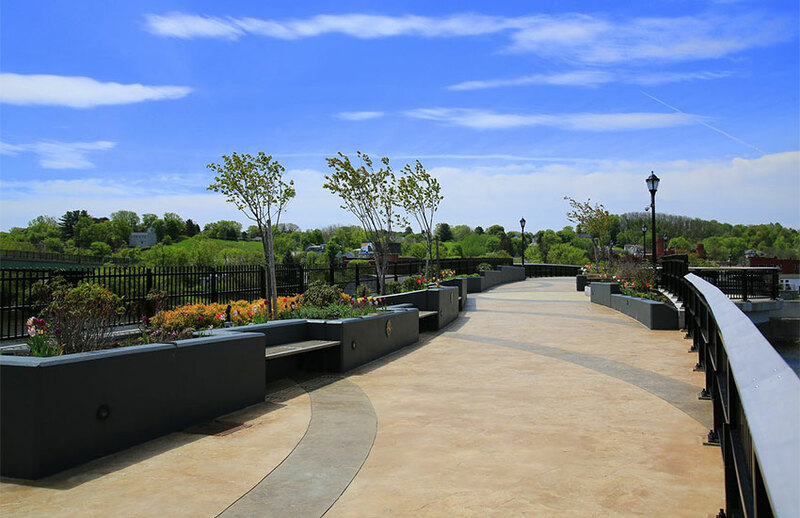 The MVGO bridge is open from Spring until the first snowfall in the Winter. 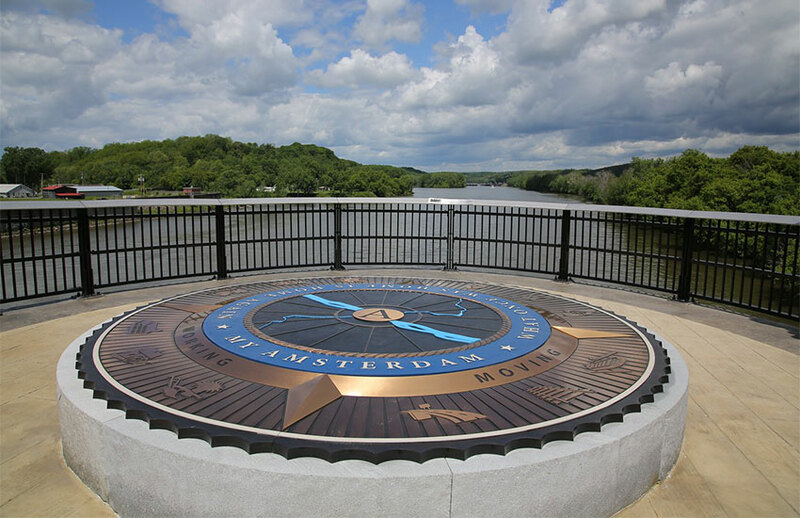 Spanning 511 feet between the north and south banks of the Mohawk River, the structure uniquely combines a park-over-the-water setting with an introduction to the history of the Mohawk Valley and its peoples, told through nearby examples from the City of Amsterdam. 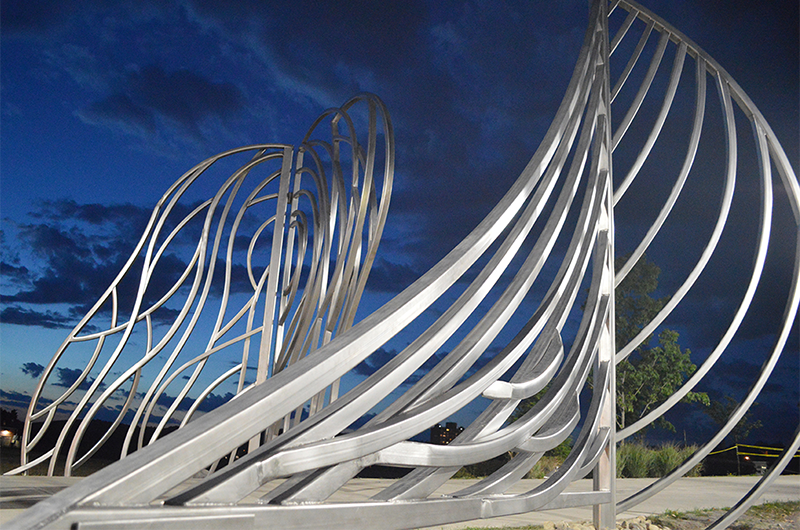 The structure is curved - not straight - to harmonize with the natural shapes of the river and valley. The textured, colored pavement reflects not only the swirls and eddies of the river, but also of history. Twelve stopping points along the north and south ends are marked with icons representing major topics in the history of the valley with an explanatory text. Those subjects are: Native Americans, early settlers, and immigrants; canal, railroad, and roads; farming, water power, and factories; nature, community, and vision. 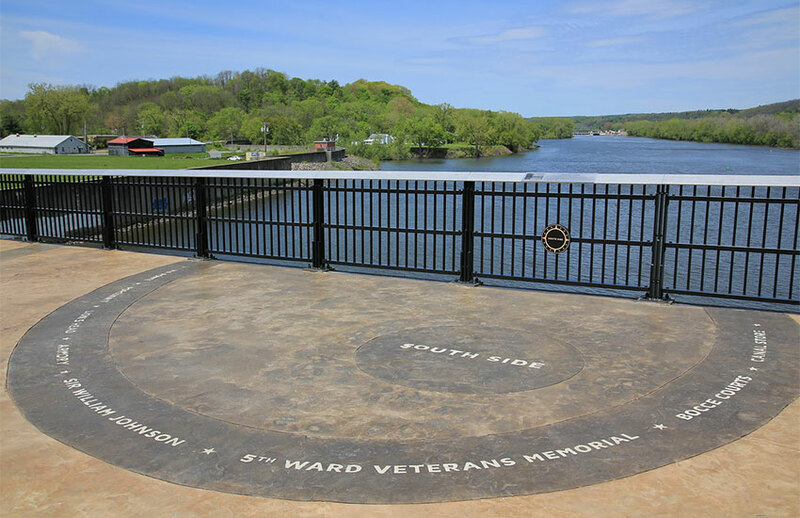 In the more open middle portion of the structure there are six rounded patterns which focus attention on markers relating the stories of six distinct neighborhoods visible from the bridge: East End, South Side, Down Town, Market Hill, Reid Hill and the West End. Each contains a photograph which is from that neighborhood but also is indicative of the city overall. The edges of the deck patterns are etched with the names of persons, places, or objects associated with each neighborhood. There are other panels off the north landing describing Native American activity in the area over 5,000 years ago and the bridging of the river. Continuing on into River Link Park, one can see the Painted Rocks sculpture and 9/11 Memorial). 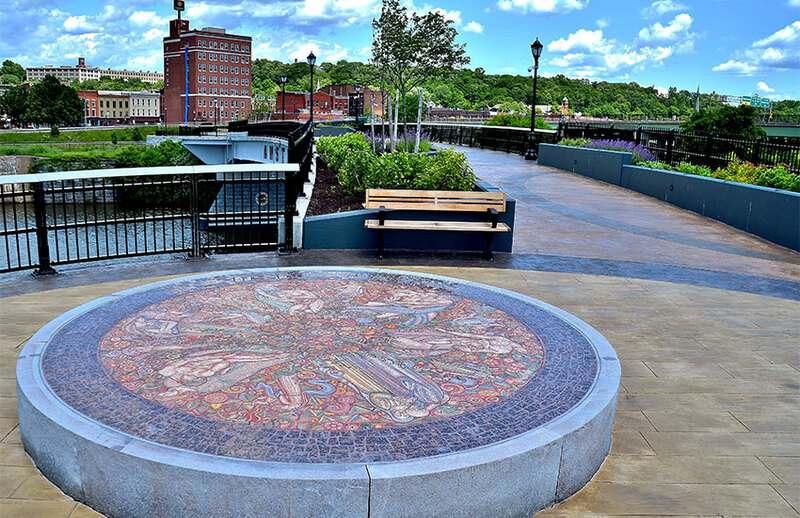 The Wheel of Life is a 12-foot-diameter glass mosaic on the Mohawk Valley Gateway Overlook bridge that is inspired by an even larger mosaic that can be found at the famous Waldorf Astoria Hotel on Park Avenue in Manhattan. In the years right before World War II, Mohawk Carpet Mills, based in Amsterdam, was commissioned to create a carpet replicating this Wheel of Life that would be placed over the mosaic in the Waldorf Astoria’s lobby. It took 16 weavers eight months to create the carpet for the hotel! Today the replica sits on our beautiful bridge. It is made with a specialty-made glass made in Venice using old world recipes and techniques and is completely handmade. The glass is made up of a mixture of high-grade silica and metal oxides that creates the vibrant colors. In the northern overlook is the “story mark, “an emblematic design with repeats and visually organizes the twelve thematic icons to highlight the four main take-away points - what the history and future of the city and valley are really all about: Living, Moving, Working and Renewing. Inscribed on it is “What once was home is home again… my Amsterdam!” from The Amsterdam Oratorio composed by Amsterdamian Maria Riccio Bryce. The quote ties it all together: the valley and city were once home to many peoples, are so now, and will be so in future; perhaps even to some who are visiting today. 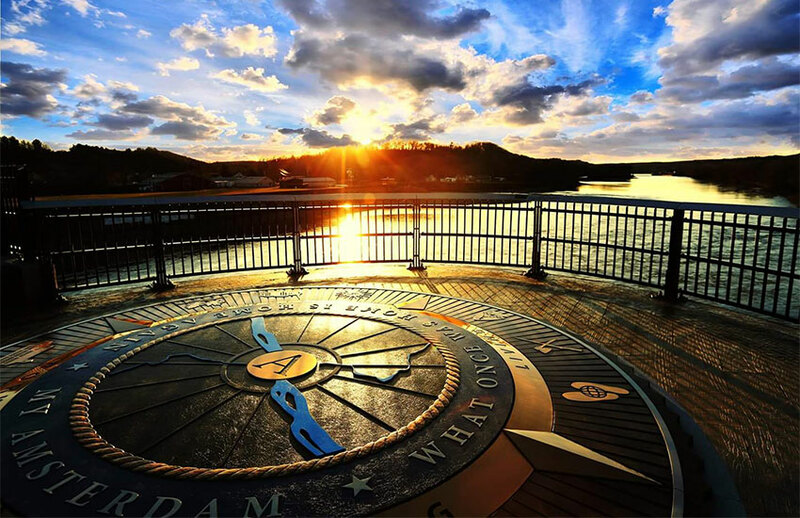 The Mohawk Valley Gateway Overlook will continue to develop new exhibits and activities as part of an ongoing plan to create a new urban corridor that spans and connects both sides of the river, from the Armory on the South Side through a multimodal transportation hub down town and up to a Sanford Mills Historic District. 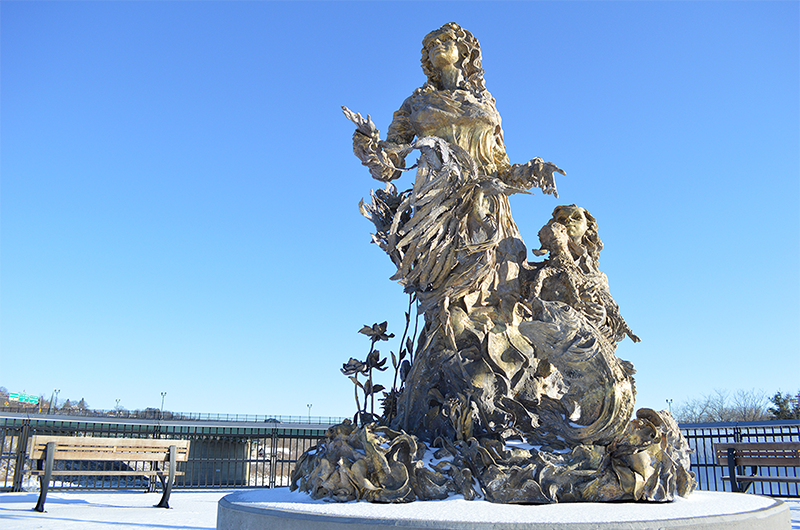 Work is also underway to commission public art for the north and south landings and create new visitor amenities. As it grows it will give visitors even more reasons to return. 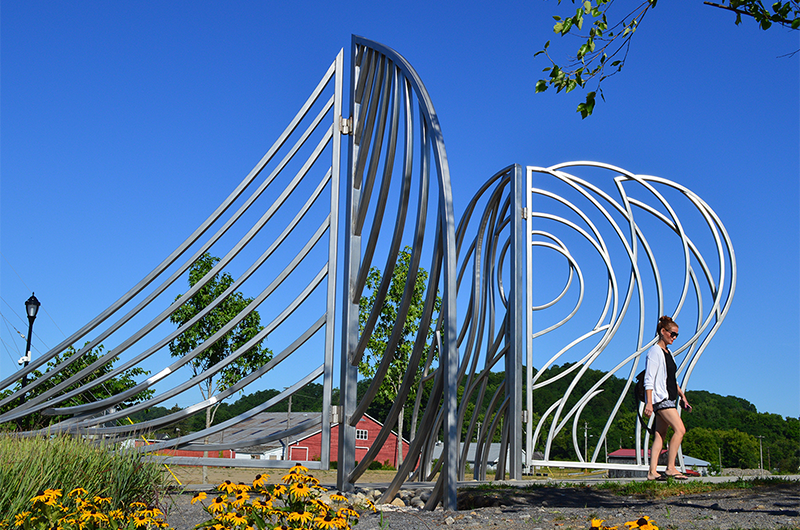 It’s a great place to start your exploration of Amsterdam and the Mohawk Valley. As Amsterdam Mayor Michael Villa said at the dedication: "Today we are not just looking back on our history but also to our future"